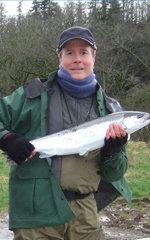 VIMS alumnus John Field has recently been named the new Executive Secretary for the Pacific Salmon Commission in Vancouver, British Columbia. Since obtaining his Master’s degree at VIMS, Field has served in a variety of federal and interstate positions in fisheries management. His resume includes stints at the National Oceanic and Atmospheric Administration (NOAA), the Atlantic States Marine Fisheries Commission, the U.S. Fish and Wildlife Service, and his most recent position as Senior Foreign Affairs Officer for the Office of Marine Conservation at the U.S. Department of State. The PSC was formed in 1985 by the Canadian and United States governments to implement the Pacific Salmon Treaty—an agreement between the two countries to cooperate in the management, study, and enhancement of their shared Pacific salmon stocks. As Executive Secretary, Field oversees a staff of 25 scientists and administrators who assist the countries in implementing the treaty from Alaska to British Colombia and the U.S. Pacific Northwest. Field says the technical training he gained in Gloucester Point helped him understand the nuts and bolts of fisheries management. “The training I gained while earning my Master’s was indispensible because if you want to go into this field, it’s vital that you understand what your scientific advisors are telling you,” he says.